You know it's over when 6 hour marathoners are making fun of you. "Glad he's self critical because he'd look terrible in his own product. Here's some openess and honesty, Fuller is a farce with a history of rifping off small business to profit his own pockets and then sending in others to clean up a mess he creates himself. His own staff constantly fear his intimidating ways and are glad he relocated to switzerland. What should be a proud Australian success story is sadly tainted by a history of damaged relationships in the local business community. Just ask ASIC who fined skins for lying about paying athletes to wear his product." This was 5 years ago. Apparently, Fuller has a history of sleaze himself. If letsrunners want to help the Guardian article, add comments. Also, it's very important to sign in and "like" the substantial comments so those rise to the top viewed. Lets just say that I am more than a little disappointed that Fake Laz is not cited in the Guardian. Cheap Euro-trash drivel! Yes, laughable, as this was the section coming through Emporia and Lebo. No mention of a crazed madman or getting lost and becoming a crack whore walking by Mr. G's Car Wash. Unless Asher works for ESPN we have exposed ANOTHER LIE!!! What, pray tell, is a "Marathon Maniac?" Is this a football team? Excellent story in the Guardian! It's great to have that sort of extended piece in the public record. I thought it highlighted most of the relevant issues. It wasn't unfair to Young--unless an insistence on stating the relevant facts is unfair. Great piece. To me the splits posted in this piece are the most damning evidence that this guy is a liar and a cheater. Any serious distance runner and especially an ultra-runner knows that these types of splits over these time intervals are completely ridiculous. 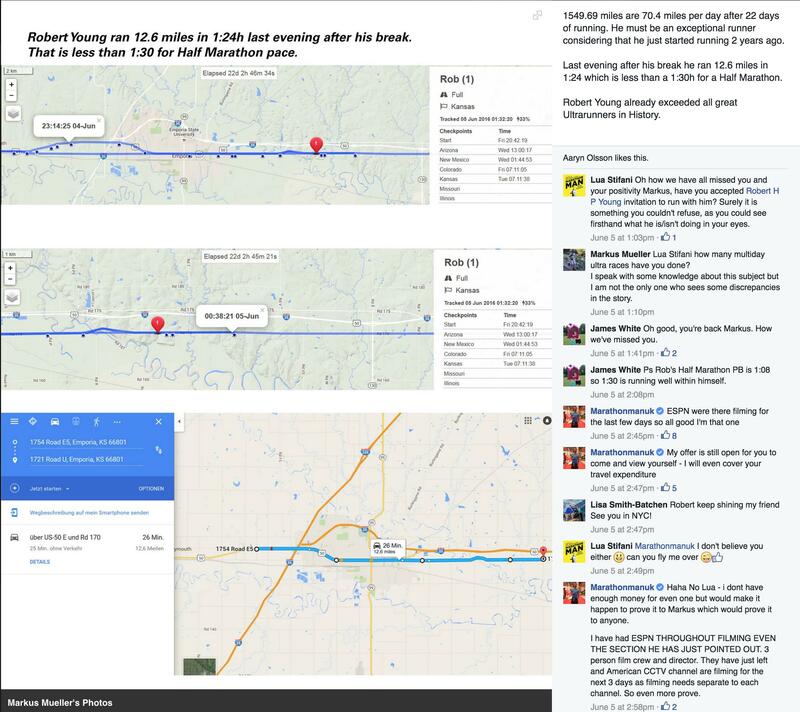 Only a noob like RY would be dumb enough to think these time splits wouldn't raise eyebrows among serious runners. I am that typical 3:10-3:20 marathoner. Nothing special but I do ok. Given that my times for shorter distances are much much faster by comparison (35 min 10K, 58 min for 10 miles, 1:19 half etc). it's hard to believe that a guy who is supposedly of similar abilities as me can just crank out 3 hour marathon paced runs day after day, covering 70+ miles. I know with complete certainty that even in my best conditioning there's no friggin way I could have run back to back 3:20 marathons with just a few hours sleep in between. They're LR maniacs who discovered life outside their basement. RE: PRESS RELEASE FROM SKINS 6/22/2016 12:31PM - in reply to whorunslikeanLGTEBADSEWRW? The second I started claiming the personal bests that he claims, without any verifiable race results to back it up is the second I should lose any and all credibility.